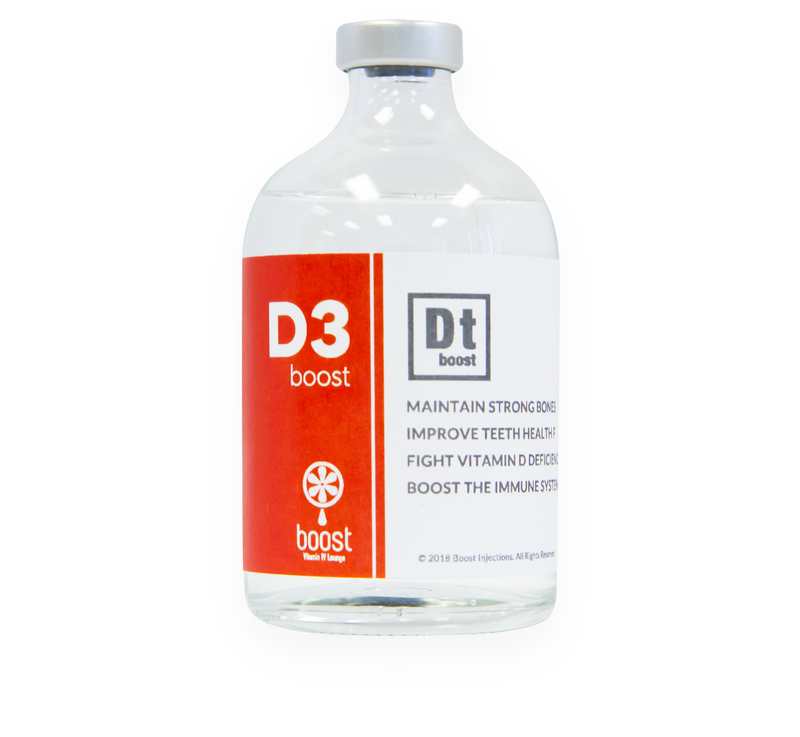 The D3 Boost is a vitamin and nutrient IM injection packed with Vitamin D-3, a crucial vitamin that ensures our bones absorb calcium in order to develop and maintain bone growth. It is also known to fight disease, promote weight loss and fend off depression. If you’re not getting enough Vitamin D-rich food (fatty fish like tuna or salmon, cheese or beef liver) the D3 Boost is perfect for you. How Does the D3 Boost IM Injection Work? With our D3 Boost, the injections of Vitamin D concentrate on two areas to help regulate your calcium levels: the intestines (stimulates absorption of calcium) and your bones (to promote bone building). You’ll feel the difference of a strong bone structure and protect yourself from the chance of osteoporosis in the future. A: IM Injection Booster shots work by administering vitamins and nutrients directly into your muscles, so that there is no GI metabolism, allowing maximum absorption of vitamins and nutrients. Common areas of your body where IM injection Boosters will be administered include the deltoid muscle of your arm, your upper thigh, and the ventrogluteal muscles of your buttocks.